Noise is unwanted or unpleasant sound and is therefore 'pollution'. It can cause major disturbances and affect human health greatly through loss of sleep, emotional stress and damage to the ear. Noise pollution can be a major problem in high density residential areas and the regulations have been designed to ensure acceptable levels are met while being flexible to allow reasonable normal activities to occur such as public events. To make a complaint regarding a noise issue contact our compliance services team here. The Environmental Protection (Noise) Regulations 1997 stipulate the allowed decibel levels and what is deemed to be 'reasonable' noise. For evening noise, these levels get strict after 7.00 pm and stricter still after 10.00 pm. If you can clearly hear noise from a neighbour after 10.00 pm within your home it is likely to be over the permitted levels. The morning levels are strict until 7.00 am (or 9.00 am on a Sunday) to then allow higher levels during the day. Factors such as the amount of traffic, commercial/industrial premises and the time of day all impact on acceptable levels of noise. The permitted levels (measured from the premises receiving the noise [not the noise source]) are stated below. *plus an added dB value to factor in traffic noise and commercial/industrial zones (specific to each location). In a quiet residential area there may be no added value required, while in a busy city centre the value may be 10dB or more. See the figure below illustrating different levels of sound. 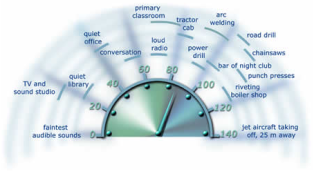 The following are examples of sound levels and sources and the effect on hearing. What can you do if your neighbour is being noisy? Approach your neighbours, as they may be unaware of the discomfort they are causing you and may be only too happy to turn it down. Compromise – negotiate with your neighbour and work together to find a solution. Noise from air conditioners can disturb neighbours. The noise can disrupt sleep, interfere with normal daily activities and can have significant impacts on people's health. Installation of an air conditioner that emits unreasonable noise is illegal. Installers can face penalties of up to $5 000 if they do not meet their legal obligations. Section 80 of the Environmental Protection Act 1997 places the responsibility on installers to ensure that an air conditioner does not emit unreasonable noise. An installer's guide to air conditioning noise provides more information on installing air conditioners. As a result of construction work being conducted Monday to Saturday between 7.00 am and 7.00 pm, the assigned noise levels do not apply to noise emitted from a construction site. Noise from construction sites is not exempt from the assigned levels after these hours or on a Sunday or public holiday. details of complaint response procedures that will be adopted (including contact details to site managers/supervisors etc). Completed noise management plans must be submitted to the City of Fremantle's environmental health services team for approval 7days before construction can commence. The Housing Industry Association together with the Department of Environment Regulation has developed a noise management plan for work from 6.00 am–7.00 am from November to April. This plan recognises the risk to workers of exposure to ultraviolet radiation in the summer months. A noise management plan application must be submitted at least 7 days prior to commencement of 6.00 am work. Contact the Department of Environment Regulation on 6467 5000 for more information. note: radios and stereo systems on a construction site are not exempt and must comply at all times with the assigned noise levels. Noise from parties can be disturbing, particularly if it is excessively loud or they happen regularly. Generally one-off parties are accepted as normal activity by neighbours but more frequent gatherings can be upsetting. Inform your neighbours of the event including date, time of finish and a contact phone number. Generally people will not mind noise from a celebration as long as it is a one-off event on a Friday or Saturday night, and it does not finish late. A party on weeknights and Sunday nights are generally not acceptable, but if there is no other time, then a 10.00 pm finish is suggested. On Friday and Saturday nights the finish time should be no later than midnight. For anti-social behaviour and noisy parties after hours, please contact the police on 131 444 and request immediate attendance. Police officers have the lawful authority to resolve anti-social behaviour. Police officers are authorised noise officers, they have the power to seize equipment and are trained and equipped to deal with persons that may be under the influence of alcohol and other substances. If the party noise is a regular and ongoing nuisance, please advise the City's compliance services team of your complaint and the matter will be investigated during business hours. Note: If the complaint is relating to foul language and abusive behaviour, the City can not deal with this and all queries should be sent to the police for assistance. What happens after you have made a noise complaint? The City's officers will contact the noise producer as soon as possible. If the issue is not resolved after this then the City may take noise measurements in your home using the 'yellow brick' sound level meter. Residents will need to record the noise and associated information as per the instructions. Should the results determine that noise levels were excessive the City will inform the noise producer of the results and the penalties that apply. If the issue continues, the City has a number of options it can take including infringements, noise abatement directions, environmental protection notices or prosecution. Noise from premises that are licensed or registered by Department of Environment Regulation under the Environmental Protection Act 1986. Click here if a premises is licensed. For more information contact Department of Environment Regulation’s 24 hour Pollution Watch hotline – 1300 784 782. The Environmental Protection (Noise) Regulations 1997 do not regulate any noise emitted from aircraft, rail, or vehicles on public roads. This includes the City's rubbish trucks. Rubbish or delivery trucks on private property are not exempted from the regulations but it is generally acceptable if they operate after 7.00 am. For more information contact Main Roads on 13 81 38 for traffic noise along major roads, Public Transport Authority (Rail) on 08 9326 2000 for noise nuisance relating to passengers trains or Airservices Australia noise complaint and information services hotline on 1800 802 584 for aircraft noise. Spa and pool pumps can be considerably annoying especially at night. Ensure your spa or pool pump is only used during the day. 'Specified equipment' (equipment that requires the constant presence of an operator for normal use for example, power tools, lawn mower, basketball) are only allowed to be used from Monday to Friday 7.00 am–7.00 pm and Sundays and Public Holidays 9.00 am–7.00 pm. The maximum time is 2 hours and it must also not unreasonably interfere with the health, comfort or convenience, of an occupier of a premise receiving the noise. Musical instruments can only be played for a maximum of 1 hour per day between 7.00 am–7.00 pm Monday to Saturday and 9.00 am–7.00 pm Sundays and public holidays. It must also not unreasonably interfere with the health, comfort or convenience, of an occupier of a premise receiving the noise. Audible alarms can be annoying if they sound intermittently. The police can gain entry to premises to switch off the alarm if it has been sounding for more than 30 minutes. The City's officers do not have right of entry and can only assist.